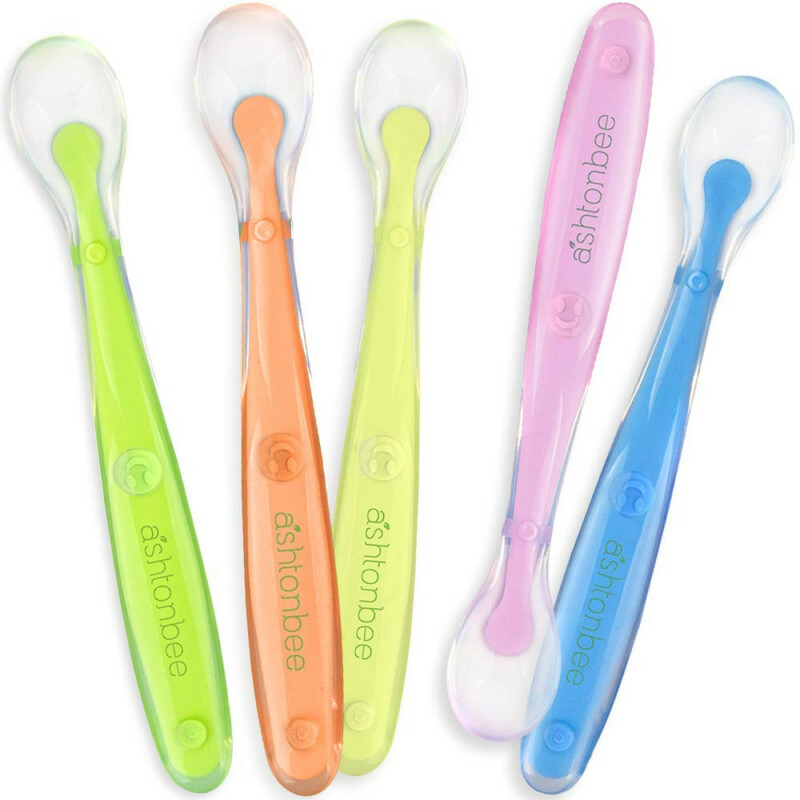 MADE FOR FIRST STAGE FEEDING - Ashtonbee's Silicone Baby Spoons are specifically designed to safely feed first stage babies. They are fully optimized so that your baby can effectively transition from drinking milk or formula, to start eating soft baby food like Gerber. Don't settle for anything less when it comes to your infant, provide them the right means to ensure that their food completely supplements their diet for these early stages! SOFT SILICONE MATERIAL - Our spoons are made out of soft silicone for easy and painless feeding. Babies tend to move a lot, especially when they are active or hungry, and the silicone material of this spoon ensures that even when they move as you feed them, the edges of the spoon will not damage their soft and tender gums. This makes our spoons the perfect tool to start feeding your child. GREAT VALUE FOR MONEY - You will surely get the best value for your money with our baby spoon set. You will not just get one spoon but five! This way, you dont have to keep washing one spoon when it falls or when you need another one for another type of food. This means convenience for every parent! STRESS-FREE CLEANING - The soft silicone material as well as the simple and no-fuss design of the spoon allows for stress-free cleaning. We know that this is a huge benefit for parents like you and one less thing to worry about. You can put them on the top shelf of your dishwasher or wash them with very hot water and natural soap. COVERED BY OUR INDUSTRY LEADING 100% LIFETIME WARRANTY - When you order from us, you're in good hands with our no-risk, no-questions asked Money Back Guarantee and Top-Rated customer service. Ashtonbee is a brand that's committed to your success! Looking for the best way to start feeding solids to your baby? Equip yourself with the right tools to give the right diet for your child! There are different types of feeding tools that help stimulate and entice infants to start eating solid foods. Sometimes they come in airplane designs, spoons with animal handles, and other quirky and child appropriate designs. However, not all of them are designed to be as safe and as painless as possible when it comes to the overall well-being of the infant. Fortunately, Ashtonbee has created a soft and easy to use product to help introduce your baby to solid food with the Silicone Baby Spoons! Theyre made with very soft material that reduces any possibility of hurting your baby. Theyre also specifically for first stage babies and are easy to use for new and seasoned parents. When it comes to your baby's needs, don't settle for anything less! The first stage of infancy is very crucial. With the wrong tools, you may end up not being able to give your child the right sustenance at the right time. Don't let this happen to you! We have developed this product so that the experience of initially feeding your baby solids is as hassle-free, effortless, and safe as possible! 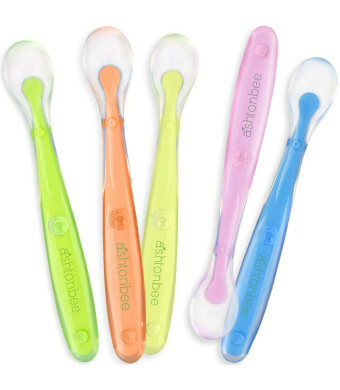 The pack includes 5 spoons per package in varying colors and are made of soft silicone material. They are slightly longer compared to other baby spoons for easy feeding.